A controversial but longtime and well-established Swedish artist, Lars Vilks (visit his homepage), was invited to take part in an art exhibition entitled “The Dog in Art” at Tällberg near Karlstad. 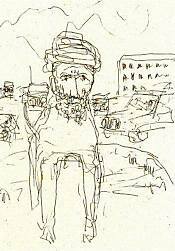 He delivered three drawings: Mohammed as a Dog. Only an hour or two before opening last Friday the organizers discovered what they had hanging on the walls. Big rush, down with the drawings. The Swedish state public radio did not say a word about it; the press however was informed via TT [Tidningarnas Telegrambyrå, the Swedish news agency], I think. The drawing shown on Steen’s blog is called “Mohammed as a Rondell Dog”. A Rondell Dog (Rondellhund) is a strange and funny phenomenon. For the last five to ten years unknown persons have placed stylized dog sculptures on traffic circles all around Sweden — for example, a white dog profile of natural size (grand Danois!) cut in plywood — often humorous. The strange thing is that the highway authorities have accepted this “habit” and have not diligently taken them away. Very strange indeed! In this editorial the newspaper Expressen reacts to the censored pictures of Mo as a dog, finishing with: But to censor free culture and free media out of fear, or because of resolutions and laws, is the wrong road to walk. Many more should stand together for freedom of speech. For more photos of Rondellhundar, see this Google image search. Readers who understand Swedish are invited to post translations in the comments of anything from these links that they think is interesting. Unlike the Danes, the Swedes have moved hastily to suppress any dangerous images that might upset followers of the Religion of Peace. Nevertheless, the Danish caper had a name — “The Motoon Crisis” — so we will need one for the Swedish version. Nothing euphonious comes to mind — “The Modoggie Affair”? 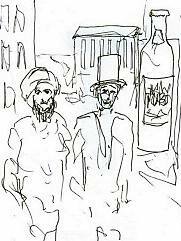 In another drawing by Lars Vilks, Mohammed and Hans Christian Andersen are visiting the Carlsberg brewery in Copenhagen. For larger versions of both drawings, go over to Snaphanen. It turns out that Mr. Vilks is one of the founders of Ladonia, an independent freestate carved out of what would otherwise be called southern Sweden. In 1980 the artist and arthistorian Lars Vilks started to work on Nimis, a construction of driftwood and rests from the cutting areas. Nimis (lat. “too much”) is situated on the peninsula of Kullaberg in the south of Sweden — now an independent state Ladonia. When Vilks started to work with hammer and nail at Nimis his ideas were rather vague, but he had in mind to make a meetingplace between theory and practice. The organizers of the exhibition must have known, based on his curriculum vitae, that in inviting Mr. Vilks they were getting no average run-of-the-mill artist. Even so, it seems that they got more than they bargained for. It is my decision and I'm not happy about it. But in part several working groups behind the exhibition were against the drawings for fear of uproar, and in part it was out of concern for Swedes abroad. Later, Wennerström says she likes the drawings herself. Never knew "Sweden" was originally Scandinavian for "coward". Or is that a recent meaning? This comment is in lieu of a trackback. The artist Lars Vilks is generally(in his and mine part of the country) considered to be a little of an "oddball" and personally I think he's a total whacko. But for once he has done something were we both share the same point of wiev even if it is probably not for the same reasons. Right now I don't give a damn. I just support him and his right of free speech. What is more surprising is that the newspaper Expressen, wich is normally a highly PC newspaper, also defend his rights of free speech. I wouldn't call it a turn of the tide, but I find it remarkable. And for Profitsbeard: No. The swede in general is not to be considered a coward. Naive, docile and trusting in authorities and media would be closer to the truth. Our problem in this country(Sweden) is a highly PC and left-wing sympathising media combined with laws not openly direct, but still aimed against expressing certain opininons considered "racistic" if uttered by a native swede. That makes it nearly impossible to express any disagreement with the political and medial "elite" and their opininons without facing the apparent and real risk of getting prosecuted or otherwise harassed by authorities, media, authoritysupported NGO:s and unoffcially supported thugs. Sweden is a democratic society in the name only which means that in the end we are probably facing underground resistance movements. These will most likely be struck hard and merciless by the "humane" and "good" people who know better. A development I like or support? No. But when the time comes we will have to choose sides. Which side I(and many more I know of) will choose is probably clear to everybody. It will not be the PC side. "Never knew "Sweden" was originally Scandinavian for "coward". Or is that a recent meaning?" Given that they beat us Danes severly through seven wars, it's most certainly a recent meaning. They used to be real warriors.